Part of the backstory for my calendar mysteries explains how Minty Wilcox, her mother, and the two youngest members of the family came to live in Kansas City. This story focuses on Minty’s youngest brother, Eddie, born with a clubfoot. When Eddie was around six or so and going to a country school, the other kids made fun of him for the way he walked. Similar to the way Lord Byron was said to move, first he thrust one foot forward and then dragged the other up next to it. After Eddie came home from school crying day after day, his mother Laura Girard Wilcox moved her youngest three children (Minty, Eddie, and Peach) into Kansas City where she could find much better medical care than she could in rural Kansas at the time. Her effort paid off, and several operations partly cured Eddie’s condition though when we first see him in January Jinx, he wears special shoes and sometimes limps. The boy with the clubfoot is based on my great uncle Croswell Doane Perkins, also born with a clubfoot. Not long after my uncle Doane’s birth on October 15, 1884, our great grandmother Laura Wilcox Perkins sold the family farm in Hobart, NY, and moved to New Brunswick, NJ. From there, she took her baby son by train into New York City for several surgeries, so he spent much of his infancy with a foot and leg inside casts. Please note that the family story credits only my great grandmother Perkins with saving our uncle Doane from a cripple’s life. It doesn’t mention our great grandfather Charles Samuel Perkins, born around 1844. My cousin Sarah Faye Morse recently checked the family records for me and confirmed that Charles S. Perkins fathered two more children with his Laura and died in 1905. So he undoubtedly was around in 1884/5 to help make important decisions like selling the family farm and moving his family from the place his forbears settled in the late 18th century if not earlier. But perhaps my mother, born on November 1, 1910, and Faye’s mother, born on March 12, 1913, omitted our great grandfather Perkins from the story because he died before they had a chance to meet him. Suffice it to say, both our great grandparents Perkins made considerable sacrifices to ensure that their fourth-born child lived and prospered. Indeed, after he grew up and got married, our great uncle Doane won dancing contests with his wife. Or so the family story goes . . . 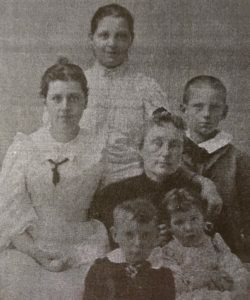 In this photograph, taken around 1896, Uncle Doane is the boy on the right, slightly behind his mother, Laura Perkins. The girl in the back is my great aunt Melicent Perkins. The young woman on the left is my grandmother Juliet Perkins Smith, for whom I’m named. The little boy in front is the youngest boy, Charles Andrew Perkins, and the little girl is Faye Marguerite Perkins, for whom my cousin is named. 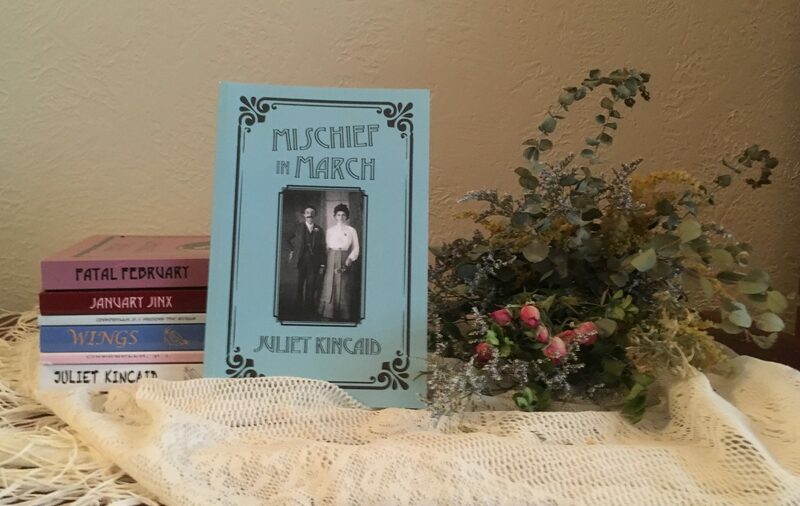 January Jinx, Fatal February, and Mischief in March, the first three novels in the calendar mystery series that feature Minty Wilcox and Daniel Price from newly met to newly wed and beyond in Kansas City a place that could get downright deadly a hundred years or so ago, are available as Kindle eBooks and trade paperbacks at Amazon.com.